By buying this product you'll earn up to 1259 Rewards points. An advanced flying machine — like DJI's Inspire 2 or Matrice 200 — deserves an advanced control interface. The Cendence controller features a flexible, customizable design that makes it ideal for commercial use, as well as serious fun. A fully integrated mounting bracket lets you use your own mobile device as a monitor, or you can upgrade to a CrystalSky high brightness monitor. It's easier to fly when you can set the controls up to match your individual preferences. The Cendence features assignable buttons and lets you create shortcuts for precise camera control. If you need even greater control, you can link two of these controllers in dual operator (master/slave) mode. That lets one operator focus on flying, while the other handles the camera. This controller gives you plenty of options for connecting to external devices. Built-in SDI and HDMI ports support broadcast-quality video transmission at (1080i 50 fps and 720p 60 fps). There's also a Type-A USB port for plugging into mobile devices and a CAN connector for additional DJI accessories. Compatibility: The DJI Cendence wireless remote controller is a professional-grade, customizable remote controller designed for full integration with other advanced DJI products; like the Inspire 2 and Matrice 200 Series aerial drones, as well as DJI's CrystalSky monitor (all sold separately). 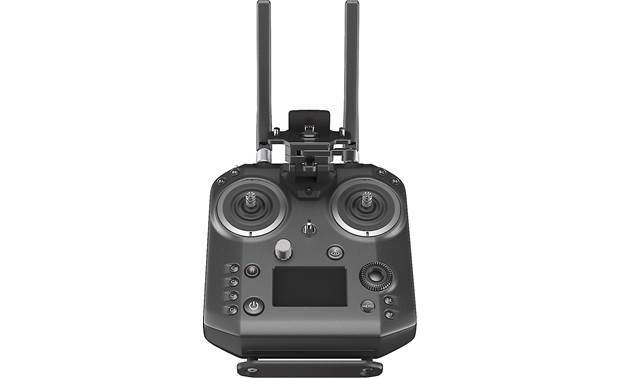 Wireless Connectivity: The Cendence remote controller features DJI's Lightbridge technology, Dual-Band WiFi (2.4/5GHz), and redesigned planar antennas to significantly increase gain, ensuring high-quality wireless video transmission at up to 10 Mbps within 2.5 miles (4 km) and wireless control up to 4.3 miles (7 km). Moreover, the antennas transmit signal in a specific direction, which effectively reduces interference from other directions and makes transmission even more stable and reliable. DJI CrystalSky (Sold Separately): DJI's CrystalSky monitor (sold separately) mounts to the Cendence remote controller via the included monitor mounting bracket system. It features an embedded version of the DJI GO 4 app for live video feed and control. The CrystalSky monitor provides smooth, real-time video with minimal latency form your Inspire 2 or Matrice 200Series drone's camera. It also give you access to aircraft parameter adjustment, camera control, footage management, and playback. DGI Go App (Requires Compatible Mobile Device & Holder): The DJI Go 4 App (for Apple iOS 9.0+ and Android OS 4.4+) turns your compatible Apple iOS and Android into a live video feed and controller for the Inspire 2 or Matrice 200 Series drone. You will need DJI's Mobile Device Holder (sold separately) and a compatible Apple iOS or Android device. Your mobile device will connect to the Cendence controller via the USB cable that comes with your smartphone or tablet. Use this app to control the gimbal, camera, and other aircraft functions. You'll also be able to view a live video feed (1080p or 720p) and flight telemetry data of your drone. In addition, the app features Editor, SkyPixel and Me sections; which are used for configuring the drone, as well as editing and sharing your captured photos and videos. Joystick & Push-Button Controls: The Cendence remote controller features joystick and push-buttons controls to operate the Inspire 2 or Matrice 200 Series drone and many of its functions, including flight and camera controls. Customizable buttons can quickly enable or disable frequently used functions. Flight Controls: Use dual 4-way joystick controllers to operate the Inspire 2 or Matrice 200 Series drone's flight pattern; including Up/Down, Forward/Backward, and Left/Right. You can also use the Flight Mode switch to select P-mode (Positioning), S-mode (Sport), or A-mode (Attitude). In addition, you can press and hold the "RTH" button to start the Return-to-Home procedure. Dual Operator Control: When precision camera control is required, the Cendence can connect either as a Master or Slave controller with the Inspire 2's remote controller or another Cendence remote controller. In Dual Remote Controller mode, two remote controllers can operate the aircraft and camera separately and simultaneously. Dual Remote Controller mode even works when uses are up to 328' (100m) apart. Detachable Rechargeable Battery: The Cendence remote controller uses a detachable, rechargeable lithium-polymer battery that is rated at 492 mAh and operates for up to four hours. If you run out of power, you can swap in a charged battery or charge the Cendence via the power port (it takes approximately 2.5. hours to fully charge the battery). Cendence uses the same battery as DJI's CrystalSky monitor. Modular & Upgradeable: The Cendence remote controller's antennas, PCB, mounting bracket, and battery are all detachable, making its hardware easily upgradable, allowing you to customize the controller for compatibility with future DJI aircraft. Searches related to the DJI Cendence Professional-grade remote controller for select DJI drones.